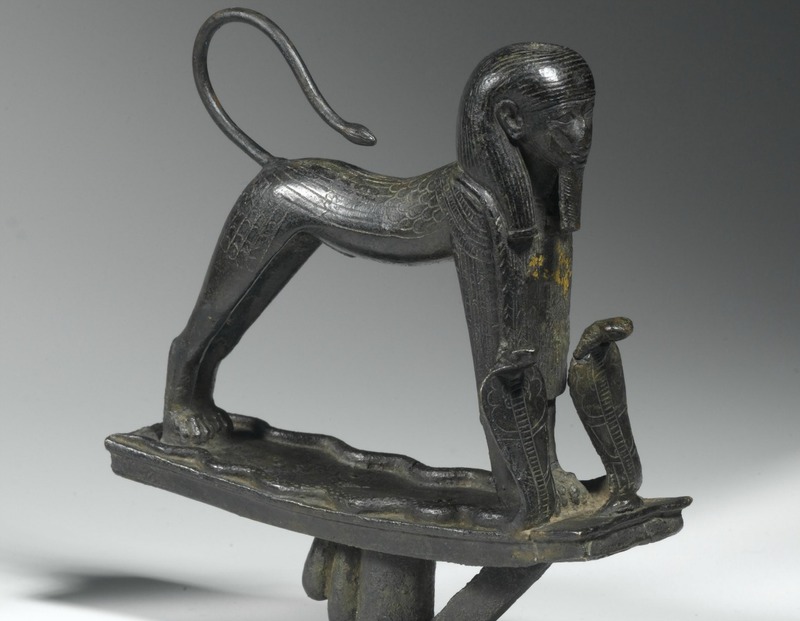 Seated Wadjet, bronze, 664–332 B.C. Jerome, full disclosure: I have two cats. JWAnd my wife and I have two cats – although one of them is irritating enough to make us consider next time getting a dog. JWTrue. To us, they’re all fuzzy and cuddly, but to them, we’re really only catfood ATMs. They’re only sticking around for the petting, the treats and the warm bed. Take those away, and they’re outta there. 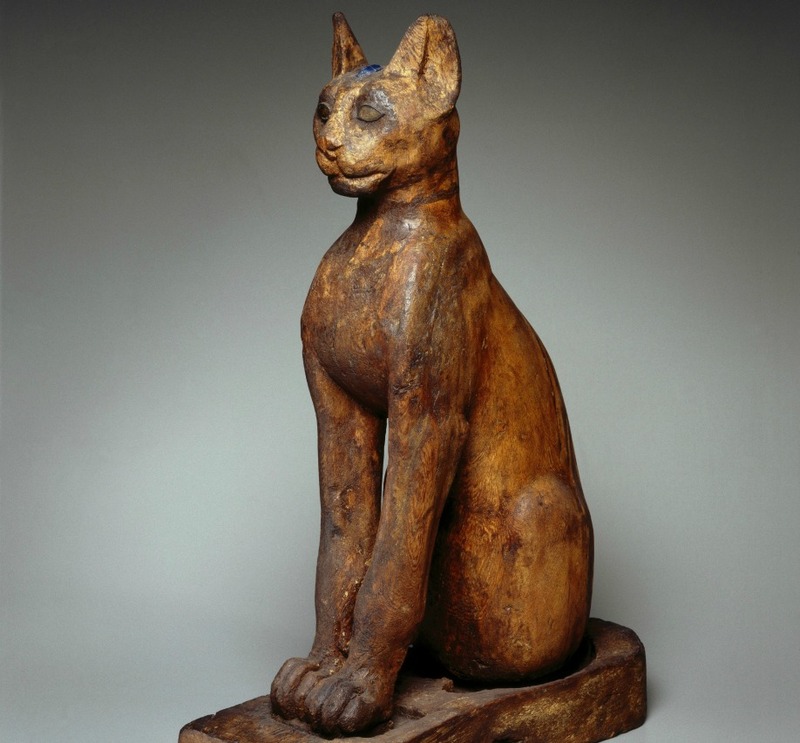 ‘Divine Felines: Cats of Ancient Egypt’ runs at the Dallas Museum of Art through January 8th. But I think this whole issue of domestication is relevant because although the show is called ‘Divine Felines,’ it’s really about the ancient Egyptians’ personal connections to cats. I mean, what’s the one fact most people know about ancient Egypt and cats? JWYeah, but I don’t think they worshiped that particular cat lounging around the kitchen doing nothing and getting underfoot. They did see cats in general as having godlike qualities — they saved the harvest grain from getting eaten by mice and birds, and that meant saving the Egyptians’ lives. I mean, the Sphinx itself is a huge lion with a human head. That’s showing some respect. So I half-expected the show—which originated at the Brooklyn Museum, which has one of the best Egyptian collections in America – I half-expected it to have a lot of giant stone temple cats. OK, so there are a couple of striking cat idols (see top image), but they’re not exactly towering. What ‘Divine Felines’ actually is is an intimate show. It’s full of little, delicate things like amulets and jewelry and bits of furniture. Figure of a cat – wood, gilded gesso, bronze, copper, pigment, rock crystal, glass. 305 B.C. – 1st century B.C. Even the little sarcophagus or the mummy case for the pet cat. JWRight. So what ‘Divine Felines’ shows us is this warm, house-pet relationship Egyptians had with cats. And I think that’s what sets them apart. A lot of ancient cultures created lion sculptures. They were fierce and kinglike. And in Egypt, same thing: The goddess Bastet was originally a lioness warrior. But after several centuries, she became a cat. Still a protector, still protecting the harvest grain. But in her depictions, she clearly turns into a housecat. I enjoyed the show. As you say, some of the pieces are beautifully made. But I wished we could have learned even more about what was daily life like with a cat back then? I realize we’re not likely to find a diary entry from 1000 B.C. saying, ‘This morning, little Mittens scratched me, so I’m reallllly all angry with her right now.’ But in the depictions here – the amulets, the hieroglyphs – we never really see humans and cats interacting. JWAnd we’re not likely ever to find something like that. But we can clearly surmise how valuable cats were because – as you mentioned – Egyptians mummified them and were buried with them. True, often this was a case of bringing a gift to the gods in the afterlife: ‘Here, have a kitten. Please don’t hurt me.’ But often it wasn’t just a gift — it was carrying a beloved pet with you into that afterlife. Plus, it was true that killing a cat in Egypt could get you punished by death. That says a lot. Striding sphinx, bronze, 945-712 B.C. Because some of these items are so small and delicate, I also wish the DMA had those magnifying lenses or portals you see at aquariums? You can slide them on the glass or plastic case – they won’t scratch them – but these lenses can give you a really close-up look at an art object. Certainly closer than you could normally get in a museum. JWI’ve mostly seen those lenses used in science museums, but it’s an interesting idea. What the DMA has done is augment the Brooklyn Museum artifacts with its own materials. So the last quarter of the show is really all about mummification. 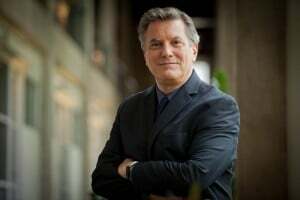 It’s presented in a very accessible way, especially for schoolkids, including a video documentary about the well-known Egyptologist Bob Brier. You get to smell some of the spices used in mummification, for instance – like frankincense. Why do you think the DMA did that? It splits the show in two – the major part is about cats, the later part about mummies. JWTo appeal to different audiences – cat lovers, who might not normally ever come to an art museum, and people who only come for shows about ancient Egypt. Also, frankly, it definitely makes this show something more than the museum equivalent of a cat video. 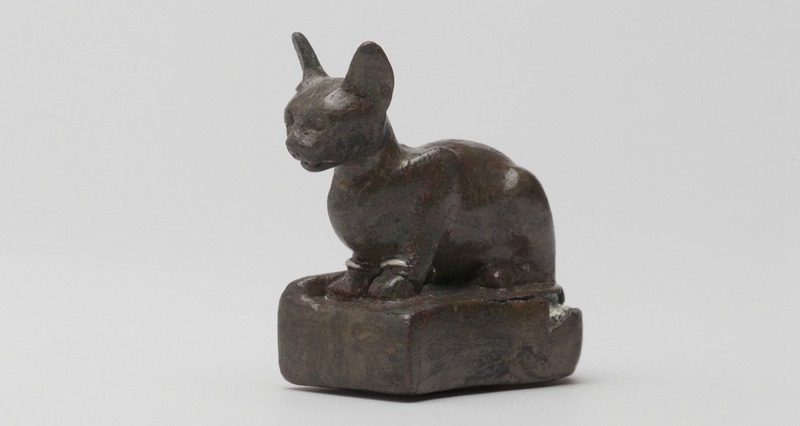 Weight in the form of a cat – bronze, silver, lead, 305-30 B.C. I am trying to download this interview to save. Is there a place to do that? Thanks! not at all worth the $16 admission price. each individual display is also quite tiny. read the scripts and view the tiny pieces.